The Town Council is the Burial Authority and administers the cemetery at Wortley Road, opposite the British School. This is a large restful space where the bereaved can sit on benches and look out over the Cotswold escarpment whilst remembering their loved ones. In 2014 the Garden of Remembrance (for interment of ashes) was given a makeover to improve the area. Compiled by Dr JE Cordwell, the tomb trail detailing most monuments and burial sites is available to purchase from the Heritage Centre. Although now closed to burials, except for family tombs and ashes, Wotton-under-Edge Town Council maintains the actual churchyard and grounds surrounding the Grade II listed St Mary the Virgin church. Work was undertaken in the grounds in 2014 and 2015 to repair collapsing stone walls, remove problematic old trees, and rediscover the historic tombs and vaults from decades of bramble and ivy cover. This calm and serene oasis near the centre of Wotton displays pretty snowdrops early in the year. Plans are afoot to provide a few more benches for walkers to rest as they proceed along the adjacent Cotswold Way footpath. This Church is very much in active use and holds regular services and community events. 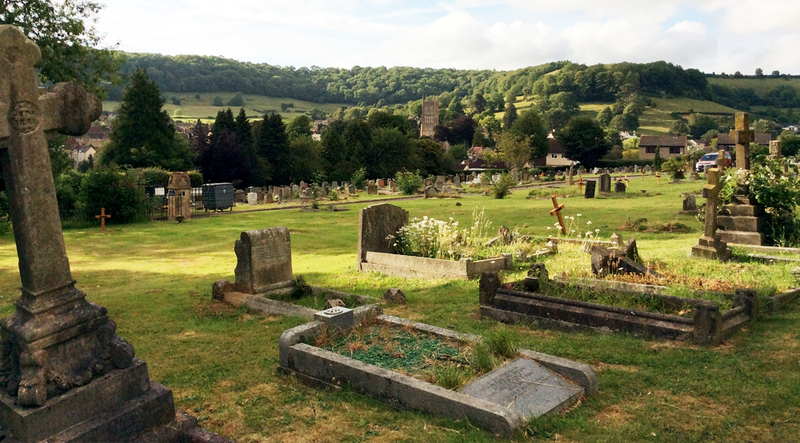 Although closed many years ago with the adjacent Rowland Hill Tabernacle (a non-conformist chapel) now the successful Wotton Auction Rooms, this small but interesting graveyard is steeped in history, as well as literally lying on a steep slope with views over the town. The Burial Register from 1824 to 1961 is held at the Heritage Centre in Wotton and lists over 1,200 burials. The Town Council funds grass cutting here. The Baptist Chapel in rope walk was built in 1818 and has a small surrounding burial ground of about 46 monuments, covering the same period as the tabernacle.